Welterweight prospect Darren Till will get the biggest fight of his career to date this weekend when he takes on Donald Cerrone in the main event of UFC Fight Night 118, which takes place Saturday at Ergo Arena in Gdansk, Poland. It's a huge step up for Dill, as the unranked prospect will take on a consensus top-10 welterweight in Cerrone, who is ranked #6 in the UFC's rankings, not to mention one of the most exciting fighters in the sport. Some will say that Till doesn't yet deserve the opportunity to fight an elite welterweight like Cerrone, but it's clear the UFC sees something special in this kid and wants to throw him into the deep water to see if he'll sink or swim. And you know Cerrone wouldn't say no to anyone, so the matchup made a lot of sense, especially considering how desperate the UFC is for main events. Till, who is only 24, is undefeated in his career with a 15-0-1 record. 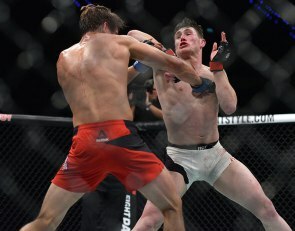 In the UFC, he's 3-0-1 so far, with decision wins over Bojan Velickovic and Jessin Ayari, a knockout win over Wendell Oliviera, and a draw against Nicholas Dalby. All told, 11 of his 15 career victories are by stoppage, so even though Till hasn't really shown the ability to finish in the UFC yet, he's certainly capable of doing so. 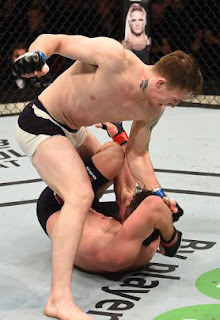 And despite the lack of finishes, he's still been quite dominant in the UFC, demonstrating an exciting striking style that gets fans interested. While Till is 24 and clearly on the way up, Cerrone is now 34 and looks to be on the way down. After starting his welterweight career off with a 4-0 record with four stoppage wins, Cerrone has dropped his past two outings, albeit to top-five fighters in Robbie Lawler and Jorge Masdvidal. Still, he's a guy who has taken a ton of damage in his career, and it looks like all that damage is finally catching up to him. Judging from the booking of this matchup, it seems like the UFC also agrees Cerrone is on a decline, and while he's still a very popular fighter, it's likely better for the organization if Till goes out there and pulls off the upset, as he's young and has more upside. Having said that, there's no guarantee Till wins this fight, and Cerrone is the favorite for a good reason, as he's the more proven fighter with more experience. But if there was any time to be catching Cerrone, it's now, and Till has a golden opportunity this Saturday to make a name for himself. The young Brit could be the new star the UFC needs in England, and with a victory over Cerrone this weekend, he could find himself headlining more cards in the future. You can never count out Cerrone, but based on the recent form of both men, there's a very good chance Till wins this fight.